UX is a qualitative foundation for digital marketing, or you can say any marketing. User experience is not only promotion of the Product. User experience can be defined as the understanding of user needs to help and create products and services that provide a meaningful experience to the customers. It is an essential feature of our digital world today. It’s an increasingly important topic now. Today consumers want their needs to be delivered instantly. Be it is finding answers via search engines, booking flights, ordering food, online shopping, internet banking, or checking with friends etc. execution of all these needs a good quality of user’s online experience and that makes a huge difference. For the businesses that want to attract and convert their interests into revenue, UX is the key part of their success and survival. UX is a combination of different principles such as visual design, information architecture, interaction design, usability, user search, and content strategy. Peter Morville, the president of Semantic Studios, is one of the pioneers of UX and information architecture. He created UX honeycomb to help to formalize the characteristics of a valuable user experience. It tells that UX should be useful, findable, credible, valuable, desirable and accessible. The honeycomb is adaptable and also outlines the principles of UX and can be prioritized based on unique needs. User experience is always forgotten when it comes to develop and execute digital marketing strategies. But it should be the first part to remember when starting a business, and it’s a critically important component of successful digital marketing that prioritizes personalization and convenience. UX is a qualitative foundation for digital marketing, or you can say any marketing. User experience is not only promotion of the Product. It touches the product itself. Marketing and designing are both different terms apart. Marketing is making people want things, and designing is all about making things that people want. Design drives user experience. That is it tends to live more towards the product design at the end of the spectrum. User experience designers often work in proximity to the digital marketing teams and are responsible for some optimisation with campaigns. User experience is a research-focused discipline. It focuses on discovering and understanding real human needs which can be solved with the well-designed product. They focus on the methodologies for research that are qualitative so making excellence in framing a problem and situation and can be more accurately assessed quantitatively. The use of multiple research approaches ensure that a product is easily discoverable and generate real human values for customers so that businesses can create commercial value. On other hands, digital marketing doesn’t generate much in ways of research. Marketing research focuses more on quantifying a known market for a fixed product. So it’s all about focusing more on quantitative methods. So blend of User experience in digital marketing can help a business to lead their sales and promotion much more than they can do it with other strategies. There is significant misconception that user experience is all about creating beautiful interfaces. But that’s not true. This is only a little part of User experience. Fundamentally, the user experience is all about the relationship between people and technology and about identifying and designing that relationship. As the amount of technology and digital disruption is increasing in the world, so too the nature of this relationship is coming to the fore. The social media impact in digital marketing field is incredible. What will happen when not just people, but products also become an essential part of the social web? In future, most interactions in social media will be between products, or products and people not just only about people. It will be everywhere. It will no longer be something that you can comfortably distance yourself from, and marketing in this situation has very little to add to this. So core skills of digital marketing alone will not work. Instead, it should subsume into larger conversations around digital products and services. More specifically, they will be they will be essential ingredients in designing your products. User experiences with the products that you promote will happen anyway regardless of whether you have included it in your marketing plan or not. The most important marketing occurs outside the moments and channels that you market to and this is called an experience. Digital marketing focuses on channels that we can use to reach customers through print, digital mobile. But customers are the people in need. People don’t have channels. They tend to live between the gaps in channels. These gaps are where user experience design lives. Recently concepts such as cross-channel experiences and omnichannel experiences have begun. Including user experience as a part of your digital marketing team will help you to redress the imbalance. As a marketer its very difficult to know what is relevant and what isn’t and it impacts your work. 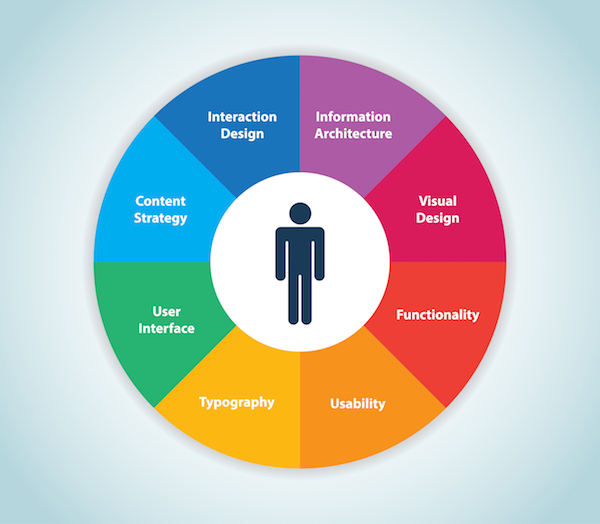 Few user experience concepts are important in your digital marketing journey. Usability is an integral part of the user experience. It looks for how a user interface is for a user. It checks how efficient and pleasant and efficient to use is your user interface is? Usability is vital to your customer’s positive or negative experiences. On the other hand user experience deals with user’s feelings and attitudes when they interact with your product or your service. Users spread positive opinions about your product and service. Delightful user experience cures your brand advocates naturally and helps to get your brand name out there on the market. So good marketing efforts create excellent user experiences and establish a long-term relationship with your brand and your customers. Digital marketing focuses on conversions, but this can result in negative UX. A positive user experience is a vital part of your success journey. So make your website reliable and a useful marketing tool so that it leads conversions. You need customer satisfaction for the adequate growth of your business. Building a positive user experience is essential to boosting customer’s satisfaction and the best way to differentiate your product in this competitive marketplace. UX is the crucial fundamental element in building relationships between you and your customers. When a user wants their desired content online they look for multiple options: browsing, searching and asking their peers in social media. Labeling, organizing, formatting, and connecting website content is significant so that both human and technology can access and understand it easily. So Good SEO is needed, and it’s a part of multiple user experience facets. Investing in visual experience is the only way to develop and sustain a positive user experience for your customers. Visual storytelling is one of the best marketing strategies of the year and also will be for the upcoming years. This hybrid form of interactive content will always win the race in promoting your brand or service to your customers. A seamless integration from the written word and still images to interactive graphs, maps and animations, the interactive story is flagging the way for new forms of transmedia storytelling in our convergence culture. Users can use the idea of including visual experiences to dig deeper and enjoy some control over their experiences and interactions with brands that are changing the face of digital marketing for better experiences. This is the most effective approach that can be used as a good strategy for all businesses. The term customer should always be mingled with loyalty. Loyalty cannot be purchased or forced. It happens gradually with consistent brand and customers relationship and interactions that are positive, engaging, and rewarding. The only magic formula to do this is an excellent User experience. Ux drives customer’s loyalty. The more you invest this in your digital marketing efforts, the better you develop loyal customers that keep repeating as thus motivating you in your success path. 79% of users will search for other pages if they don’t find the page that they are in is reliable. 96% of smartphone users have encountered websites that are not mobile friendly or are not designed to be appropriately displayed on mobile devices. 48% of users say they become frustrated when they find poorly optimized sites for mobile devices. 71% online publishers claim well formed mobile content to boost user engagement. 95% of customers agree with the good user experience. 63% of user searches uses multiple devices like smartphones, tablets, laptops, PCs, etc. There are a lot of statistics like the points mentioned above which can prove that UX is essential and matters tremendously in digital marketing. Customers want to be highly interactive and visually pleasing virtual environment to engage with the brands. User experience cannot be considered as an optional point in this digital marketing era. If you don’t satisfy customer’s expectations, then they will merely move to next brand or business. You have to invest time, money, and resources to give UX the attention that it deserves. The upfront cost is very less as compared to the benefits that you are going to get on your success journey. So start prioritizing positive user experience.